The workers' employer disputes the finding, and it's headed toward a possible hearing, yet to be scheduled. A subcontractor on the new Highway 99 tunnel underpaid 46 workers a total of $370,666 for receiving and depositing dirt in a quarry across Puget Sound, according to a state prevailing-wage investigation. Their employer disputes the finding, and it’s headed toward a possible hearing, yet to be scheduled, said Matthew Erlich, spokesman for the state Department of Labor and Industries (L&I). Workers handled earth that had been excavated in Seattle from the back end of tunnel boring machine Bertha, when it arrived across Puget Sound to the former Mats Mats quarry near Port Ludlow between 2013 and 2017. 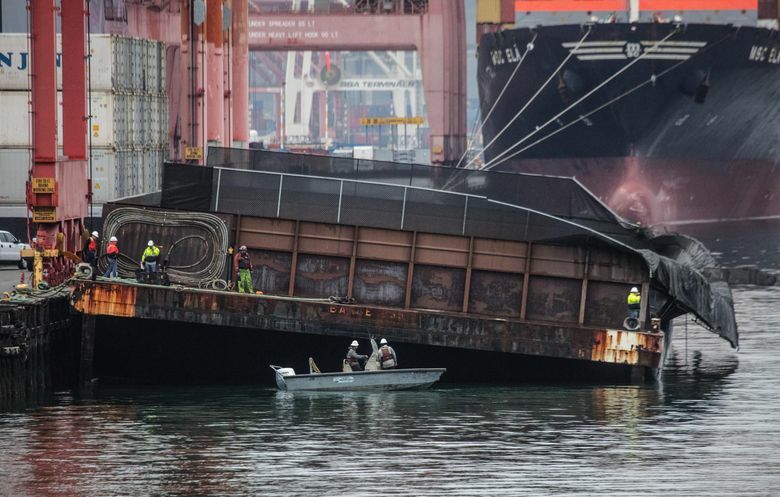 They were paid $27.69 to $31.34 per hour but should have received $49.48 an hour to operate floating cranes, loaders, dump trucks, dozers and excavators, L&I said in a news release Tuesday. In all, the group spread an estimated 2.2 million tons of dirt at Mats Mats. Washington law ordered public agencies to buy electric cars. They're falling short, report says. The L&I citation was appealed by Glacier Northwest, which owns the disposal site, and by prime contractor Seattle Tunnel Partners (STP), which is a partnership of the Spanish-based Dragados tunnel firm and the California-based Tutor-Perini construction company. The tunnel opened to traffic Feb. 4, three years behind schedule. STP contracted with Washington state to build the two-mile tube for $1.44 billion but filed more than $600 million in lawsuits seeking additional payment. Mats Mats was singled out because the International Union of Operating Engineers wanted that, Payne said. That union is officially an “interested party” in the case, a state letter shows. Dollars owed to each employee vary by hours worked, in a range from about $90 to $30,500, a state letter said. “The law is clear in this case. The use of public funds means Glacier has the responsibility of paying proper prevailing wages,” said a statement by Jim Christensen, L&I’s prevailing-wage program manager. The citation mentions that the higher wages are based on what unionized operating engineers make. In addition to payment of the back wages, the state proposes a 20 percent, or $74,133, penalty, along with $1,500 in fines for three alleged paperwork violations. STP could potentially be involved in a final resolution, Erlich said. In a larger dispute in 2012, Sound Transit contractors wound up paying $3.7 million in a L&I prevailing-wage case, involving hundreds of concrete-bridge components installed for light-rail trackway. The state found workers were entitled as much as $50 per hour, for fabricating concrete segments in Cashmere, Chelan County, at wages between $9 and $18 per hour. That investigation was requested by Ironworkers Union Local 86 based in Tukwila. L&I says it closed 300 prevailing-wage cases last year that delivered $1.46 million in payments to workers. Among other goals, the law helps ensure “a level playing field” among bidders, the agency says.